At Spot On Panels we value our working relationship with your business. We aim to reduce the work load of your fleet controller by arranging repairs of your company vehicles from start to finish. 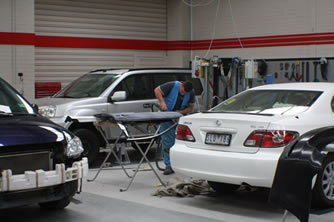 This includes towing, pickup, claim lodgment, liaising with your insurance broker, quotes, assessments and repairs. Replacement vehicles will be provided when needed to keep your staff on the road. Your repaired vehicle can be delivered directly to you; washed, clean and ready to go. With 3 convenient locations we give our fleet clients priority, shifting the work between shops to ensure the fastest possible turnaround. We have a dedicated Fleet Care Coordinator who will keep you informed of progress and ensure you the best possible service. If you would like to talk with us about reducing the stress of your fleet repairs, then call our Fleet Care Coordinator – Tony, on (03) 9307 2412 – to tailor a package to suit your needs.